When we talk about Karma, it’s usually… not in a good way. But sometimes, it pays off to be a decent person, and J’Mmar Coleman found that out firsthand. On May 17, 2018, Migos rapper Offset wrecked his new Dodge Challenger in Atlanta. It was a pretty gnarly wreck; Offset was posting pictures of himself in a neck brace with some pretty gnarly cuts on social media. But he recently posted something in the aftermath. According to the 26-year-old Offset, J’Mmar was the only one to help after the crash. He got Offset out of the car, checked him over, walked him home, took him to the hospital, and then just disappeared without even knowing who he was helping out. J’Mmar was just being a good dude. But that pretty basic good deed didn’t go unnoticed. Offset and his fiancée Cardi B were so impressed that someone would actually just do something out of the good of their own heart that they tracked down Coleman. 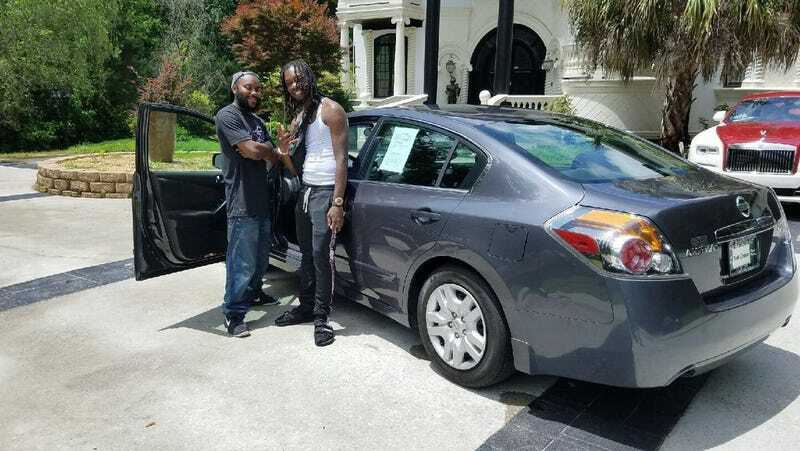 And he bought Coleman a brand new Nissan Altima. It’s a pretty feel-good story. It’s not the kind of stuff we’re used to seeing pop up in a news cycle, but it does kinda make the world seem a little bit brighter. It just goes to show that being a decent human being doesn’t go unnoticed.